Fast Times At Ridgemont High #9 - "People On 'Ludes Should Not Drive"
Fast Times at Ridgemont High is a 1982 American coming-of-age teen comedy film written by Cameron Crowe, adapted from his 1981 book of the same name. As a freelance writer for Rolling Stone magazine, Crowe went undercover at Claremont High School in San Diego, California, and wrote about his experiences. The film was directed by Amy Heckerling (in her feature film directorial debut) and chronicles a school year in the lives of sophomores Stacy Hamilton (Jennifer Jason Leigh) and Mark Ratner (Brian Backer), and their respective older friends Linda Barrett (Phoebe Cates) and Mike Damone (Robert Romanus), both of whom believe themselves wiser in the ways of romance than their younger counterparts. The ensemble cast of characters form two subplots with Jeff Spicoli (Sean Penn), a carefree stoned surfer, facing off against uptight history teacher Mr. Hand (Ray Walston), and Stacy's brother, Brad (Judge Reinhold), a senior who works at a series of entry-level jobs in order to pay off his car, and who is pondering easing out of his relationship with his girlfriend, until she herself dumps him. In addition to Penn, Reinhold, Cates and Leigh, the film marks early appearances by several actors who later became stars, including Nicolas Cage, then billing himself as Nicolas Coppola, Forest Whitaker, Eric Stoltz, and Anthony Edwards. Among the actors listed, Penn, Cage, and Whitaker would later on in their careers win the Academy Award for Best Actor, with Penn winning twice. 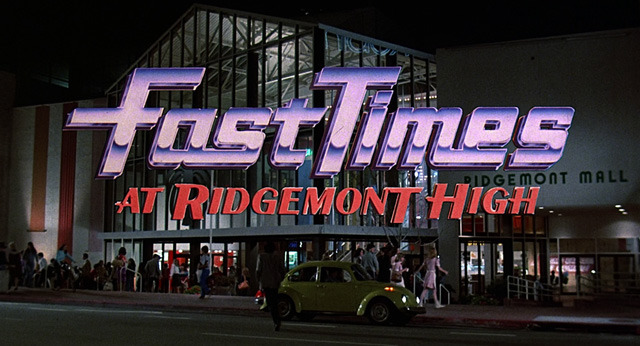 In 2005, Fast Times at Ridgemont High was selected for preservation in the United States National Film Registry by the Library of Congress as being "culturally, historically, or aesthetically significant". Fast Times At Ridgemont High #2 -Hey, Bud, let's party! Fast Times At Ridgemont High #6 - "What are you people, on dope?" Fast Times At Ridgemont High #8 - No shirt, No Shoes, No Dice.